NEW: Treasury chief Timothy Geithner urges banks "to go the extra mile"
President Obama: Small businesses are "one of the biggest drivers of employment"
WASHINGTON (CNN) -- President Barack Obama vowed Monday to ease the financial plight of the nation's small businesses, promising immediate action to revive frozen credit markets. 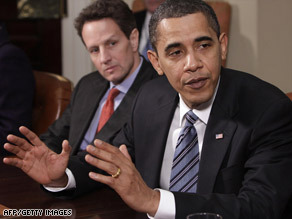 President Obama on Monday, with Treasury's Timothy Geithner, says small businesses are job generators. The president called small businesses "one of the biggest drivers of employment that we have" and said his administration is "working diligently to increase liquidity throughout the financial system." Obama spoke to reporters after he and Treasury Secretary Timothy Geithner met in the White House with representatives of the Small Business Administration. But Obama cautioned that it will be a long-term effort. "Understand, this is still going to be a first step in what is going to be a continuing effort to make sure people get credit out there," he said. Geithner said the administration is moving "with exceptional speed" on aid to small businesses after more than a year of recession. Geithner said the package will nearly double, to $250,000, the new capital investment that can be written off and said it will include provisions to reduce and then eliminate capital gains taxes in stock and to make health insurance more affordable. In addition, the Internal Revenue Service announced Monday that small businesses will be able to carry back business losses for five years instead of the current two years "in order to increase your cash flow as we come out of this period and allow you to invest more in your operations." Geithner then directed comments to the banks, urging them "to go the extra mile." Those banks that individually choose to "pull back out of a sense of prudence and caution" result in a collective impact that will weaken the economy, he said. "This dynamic can feed on itself." He noted that many banks got into trouble by taking too much risk, but he said, "The risk now to the economy is that you will take too little risk." Geithner said the nation's top 21 banks receiving assistance will be required to report on a monthly basis how much they are lending to small businesses. Even small businesses with good credit histories have been denied loans in the downturn. This year, at current rates, SBA-guaranteed new loans would not reach $10 billion. In an average year, it guarantees $20 billion in loans. Christina Romer, who heads the Council of Economic Advisers, said Sunday the government would pump "a significant amount" of money into boosting small business lending, but she did not reveal a total figure. "We know that small businesses are the engine of growth in the economy, and we absolutely want to do things to help them," Romer said on NBC's "Meet the Press." Two senior administration officials said the administration's plan deals with two programs handled by the SBA. The first one, the "7(a) program," allows small businesses to get loans of up to $2 million backed by the federal government through the SBA. Currently, the government guarantees up to 85 percent of loans below $150,000, and up to 75 percent of larger loans. Under the administration's plan, the government temporarily will increase the loan guarantee to 90 percent as an incentive to banks to lend. The administration believes this increase will reduce the risk lenders face when they make loans to borrowers who cannot find credit elsewhere and ultimately give the banks more confidence to sell and make more loans, the officials said. The second program, the "504 program," guarantees up to $4 million worth of economic development projects for small businesses. Starting Monday, the administration temporarily will eliminate fees for lenders and borrowers on any new 504 applications. The aim is to reduce the costs to both borrowers and lenders participating in the program, the officials said. The administration also temporarily will eliminate the upfront fees for 7(a) loans that banks charge borrowers. These fees go up to 3.75 percent for larger loans. The administration believes this move will decrease the cost of borrowing for small businesses and make it easier for them to get the credit they need to make new investments, the officials said.